With the overwhelming needs post-Sandy, we are organizing a HURRICANE SANDY RELIEF BENEFIT CONCERT with our November Songwriter’s Beat, to benefit people directly impacted by the hurricane. Please come, listen to great music by David Conrad, Valerie Ghent, Sasha Papernik, Lucy Foley, Chris Lee, and help us raise funds for Sandy Relief. Please join us & help spread the word by sharing this and by bringing friends to the show. See you Thursday! Let us come together, raise our voices together in song and spread a little love in the world. 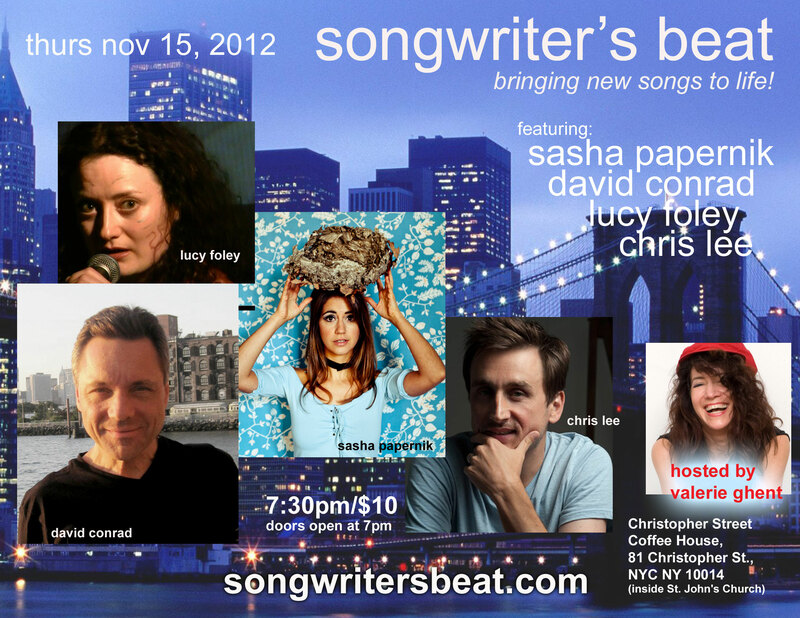 Admission $10 – PROCEEDS TO SANDY RELIEF – DONATE MORE IF YOU CAN! TIME: Doors 7pm, Music 7:30pm. Now in its 12th year, Songwriter’s Beat is NYC’s premiere performing songwriter series. Hosted and founded by Valerie Ghent, four outstanding songwriters perform new material each month in a supportive and intimate atmosphere at Christopher Street Coffee House. Every third Thursday, four songwriters of varying musical styles perform original songs and are encouraged to try out their newest material and arrangements. 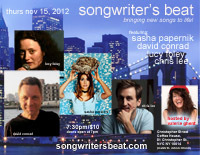 The series culminates in a week-long festival each July, featuring performers from throughout the years.Founded in 2000, The Songwriter’s Beat has presented over 325 songwriters from the Tri-State area as well as visiting songwriters from other parts of the United States, Canada, France, the UK, Ireland, Australia, South Africa, Cuba, Denmark, Sweden and Japan. Songwriter’s Beat is honored to receive support from The ASCAP Foundation. Songwriter’s Beat – bringing new songs to life!